With another St. Patrick’s Day behind us, it is appropriate to tip our hats to the nation’s tow truck operators. They have come out in force to make the holiday weekend safer than it would have otherwise been by offering free tows to people who understand they are not fit to drive. They did the same thing over the Christmas and New Year’s holidays. Tow truck operators willing to provide tows and rides to impaired people are doing more than just helping folks who have had too much to drink. They are helping all of us by keeping unsafe drivers off the roads. Free bus rides are good, as are free taxi rides, but a tow gets both driver and car home safely. In some cities and towns, tow truck operators offer free services of their own accord. But in many places, they are collaborating with other organizations including local police agencies. In Florida, Georgia, Indiana and six other states, they partnered with AAA to provide the ‘Tow to Go’ program over the St. Patrick’s Day weekend from March 16-18. AAA has been offering Tow to Go program since 1998. They estimate they have worked with local tow truck operators to handle upwards of 25,000 cars in that time. The idea behind the program is to come to the aid of drivers who, for one reason or another, did not plan ahead before going out. According to Fox 35 in Orlando, the annual program is subject to available drivers and current demand. Where possible, the AAA will arrange for a tow truck to pick up a car belonging to an impaired driver and ferry both home safely. It may be that truck drivers involved in the AAA program are paid for their services. Yet they are still taking a risk every time they go out. Tow truck driving is dangerous work regardless of the location of a recovered car or its destination. In addition, truck drivers offering services to impaired drivers have to deal with those drivers as well. It’s a far different thing compared to recovering a car that won’t start. From a mechanical standpoint, the truck operator still hooks the car to the yolk or pulls it up onto the flatbed. He or she still secures the car in place with chains, hooks, and wheel straps. Temporary lights are fixed to the car if it’s being towed on a yoke rather than a flatbed. But then the driver does one more thing that is out of the ordinary: he or she invites the impaired driver into the cab for the ride home. At this point the truck driver is carrying cargo even more precious than the car behind it. This goes above and beyond what is normally expected of a tow truck operator. And for that, such operators deserve our respect and our thanks. At Mytee Products in Aurora, OH, sales personnel speak with lots of tow truck operators who can tell harrowing stories of life on the road. Some of their stories have taken place on holidays like New Year’s Eve and St. Patrick’s Day. Mytee sales personnel can testify of the need to give tow truck drivers room to work safely. Next time you’re driving down the road and you see a tow truck driver doing his or her job, slow down and pull over. They keep us all safer by offering free tows on select holidays; watching out for their safety is the least we can do. 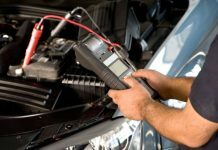 Next articleHire the mobile mechanic at any time you need!